At 50 Degrees North, we are often asked when is the best time to view the Northern Lights, and fortunately for us, there is a large window of opportunity offered in our region. Between the autumn and spring equinox (21 September – 21 March), the Aurora lights are at their most frequent. To see the lights, it needs to be dark and cold with as little cloud as possible. Check out the daily Aurora Sighting website here to see how the Aurora is fairing this week. Although October and November can be stormy, particularly along the coast, they are generally good months. From December, the weather starts to dry up and snow generally covers the landscape. Creating the picture perfect white Christmas and winter wonderland, the snow provides the opportunity to combine your Aurora Borealis search with fun adventure activities, such as dog sledding, skiing and reindeer sledding. Bear in mind that during the darkest part of winter (December to early January) you may only have a few hours of daylight with extended dawns and dusks. What about when it is a full moon? If the Northern Lights are very weak and taking place directly on front of the full moon, the full moon might pose a problem by drowning the Aurora Borealis in light. But in our experience, any half decent Northern Lights show will be clearly visible even during the full moon. The Northern Lights cannot be guaranteed on any given night. At times, our guests have seen numerous strong displays over the space of a few hours, while the week after, as conditions change ever so slightly, the lights are not visible. Be sure to actually LOOK NORTH when you are out there searching. 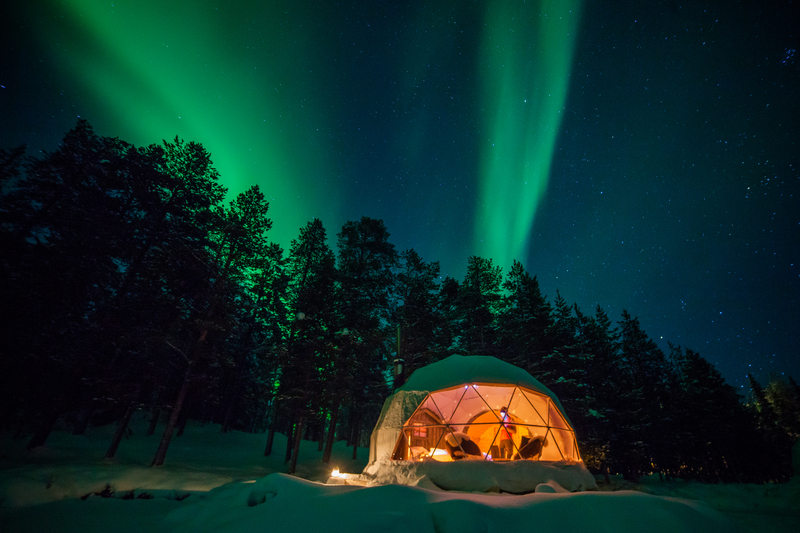 Our packages here are designed by local Scandinavians to maximize your chances for viewing the Aurora. Aligning the best time of year to see the lights with the best location is something we do for all our packages. High above the Arctic Circle, several of our countries are excellent Aurora Borealis destinations. Norway’s Svalbard, Greenland and Iceland, as well as Norwegian, Finnish and Swedish Lapland are all within the Northern Lights zone. Are you after an active adventure trip, or a city based sightseeing trip? Do you want to stay in ICEHOTEL or head to Lyngen Lodge and enjoy a champagne on their deck? The locals of this region have done a great job making the best of a cold winter; Jacuzzis on the front porch, glass igloos, and cozy lodges are just some of the features that will make your stay memorable.